PINA, the world’s largest tech company, has developed—possibly by accident—a mysterious, almost invisible time-travel device called “Port,” from which only one or two people have ever returned. Neither this nor the exorbitant price put people off trying it out: soon the world’s population has dwindled to almost nothing. 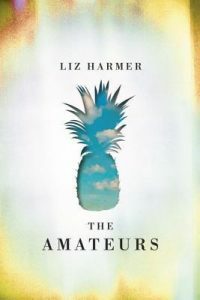 At the beginning of Liz Harmer’s excellent debut novel, The Amateurs, Marie, a former artist and art-supply shop owner in an unnamed Hamilton, Ontario, shoots a deer. When the group of forty-two Port “survivors” eat it, “[p]eople came up to Marie with tears in their eyes—as though by killing the deer, she’d healed their firstborns.” After the feast, it’s guitars and joints around the campfire. The new reality seems idyllic, but the conversation tells a different story: they endlessly discuss whether the group should move south for the longer growing season and milder winters. Lovelorn Marie is one of the few who refuses to move—she still holds out hope that Jason, her ex-husband, will beat the odds and return through Port. For Marie, first one dream and then another turns out to be a bust in reality. There’s the “normal” dream of normal times—the one where Marie and Jason got married too young, and lived happily creating art. Then there’s the dream that Harmer appears to partially share but also enjoys poking holes in: the dream of restarting from scratch, of a romantic subsistence lifestyle. But people still cling to their pre-Port identities and beliefs, like veganism, and Harmer gets good mileage out of the narcissism of small differences writ large. The novel’s second section moves to PINA headquarters in California, where the company’s thousand or so employees and their families are in thrall to the cult-like figure of the company’s CEO and founder, Albrecht Doors. Despite the shortages and inconveniences of their new living situation, they still find time to maintain their hipster lifestyles. There’s yoga, micro-brewed beer, dandelion-green salads. But this hides a darker reality: they’ve consumed almost two-thirds of their bottled water supplies, and have no more idea how to survive than the small group in Hamilton. Brandon, Doors’ naïve right-hand man, starts to look for a way out when he learns that Doors knew early on that Port was drawing people in, or somehow contagious, and that he did nothing to stop it. Here Harmer takes our current concerns about data, information, and selling personal privacy to one potential conclusion: genocide by stealth. Does Doors have an environmental motive? Population collapse brings about a hard swerve that avoids many of the worst effects of climate change, but it appears he’s unprepared for a post-infrastructure world. In the final section, “The Travellers,” Brandon makes his way north, passing through Portland, still recognizably Portlandian. The people there have ducks, chickens, goats, and are smug in the knowledge that the urban farming trend has saved them. In Hamilton, where he has gone in the vain hope of finding his mother, Brandon meets Marie. There’s an attraction, a connection. But then the unexpected happens and Jason returns, ill, confused, causing the group’s plans to change once more and leading the plot to its close. In each section, Harmer’s writing is sharp and quotable. She is very good at observing the paradoxes and contradictions implicit in human striving, but also accomplished at world-building; her writing calls to mind Lauren Groff’s Arcadia or Claire Vaye Watkins’ Gold Fame Citrus in its blending of the domestic with the political. But The Amateurs is even more symbolically layered than either of these: Port isn’t only a metaphor for events in our past that can’t be changed without destroying our present, it also functions as one possible endpoint of our reliance on technology and our willingness to sell our data. Port knows us so well, it can promise us the world. As Jason shows, Port is a Pandora’s box that no one can close.